Within the Creative Arts Key Learning Area (KLA) explicit teaching occurs that addresses the art forms of Visual Arts, Music, Drama and Dance. Creative Arts gives students the opportunity to express themselves in a variety of forms. Regular learning experiences are provided by classroom teachers in order for our students to gain understanding and accomplishment in these art forms and for the students to appreciate the meanings and values that each of the art forms offer personally, culturally and as forms of communication. Music has an important place in the life of our school. Students in all classes have a music lesson each week with our music teacher, Mr Dominic Meagher. Students are involved in activities where they are performing, listening and organising sound and they learn to love music through their experiences of singing, moving, composing and playing. 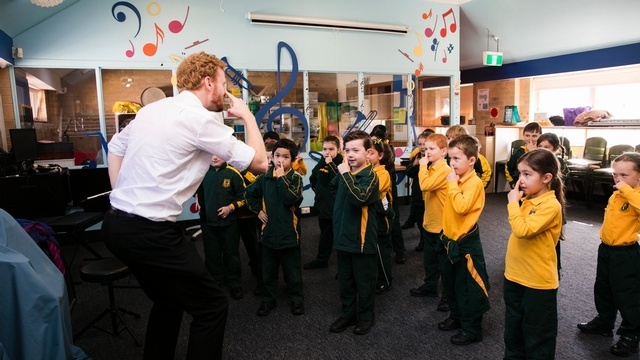 Additional to the class based music program, the children in Years 3 – 6 are able to participate in our choir program co-ordinated by Mr Dominic Meagher. We also have a school band under the guidance of Mrs Helen Jacobsen.